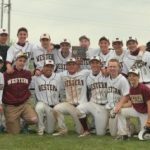 Boys Junior Varsity Baseball, Boys Varsity Baseball · Apr 16 Western Baseball Wins Clinton Invite!! This week in WHS Women’s Track and Field for Monday, April 16, 2012: Monday, April 16: practice 2:50 Tuesday, April 17: practice 2:50 Wednesday, April 18: practice 1:50 Thursday, April 19: practice 2:50 Friday, April 20: Women’s Varsity at Olivet College Invitational. More information to come as this is a new meet for us. Mass Sports Physicals Date: Wednesday, May 9th & Thursday, May 10th Time: 4:00pm – 7:00pm (both nights…if we still have a line at 7pm, we will stay until everyone gets through.) Cost: $20.00 per physical Location: Auxiliary Gym/Boys & Girls PE locker rooms (used for physician’s exam). The JV Boys Golf Team posted a 421 team score yesterday at Cascades Golf Course in the County JV Invitational. Leading the Young Panthers was Jared Lamberson with a 98, followed closely by Nick Dobbin’s 102. Coletrane Lewis and Hunter Gilbertson rounded out the scoring with a 110 and 111 respectively.